Talk about courage, these men, Randy Denmon and Dean Lewis, have it. I would never attempt to do what they did. He and a friend took an electric car, a Tesla S and drove it from Louisiana to the Panama Canal. What terrified me were the very things they had to worry about. A lot of these countries have drug lords. They also had to worry about to deal with policemen who did things their own way. 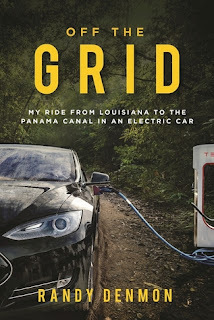 For me the scariest thing was not knowing where they were going to be able to get electric to power their car. They took all kinds of plugs and extension cords. The Tesla sits real low to the ground. This was also a problem for them. They were not always driving on real smooth roads. There were treacherous mountain roads. There were roads full of potholes, bumps, and other problems like volcanoes. The book, for all of the issues they faced is very upbeat due to Randy’s attitude/sense of humor. As much as I loved the book and knew things had to turn out okay, since they made it back to write the book, I worried for them and their safety the entire time. This was definitely different from what I usually read. That is probably why I enjoyed it so much. I could live through their trip without having to do the physical traveling, from the safety of my own home.